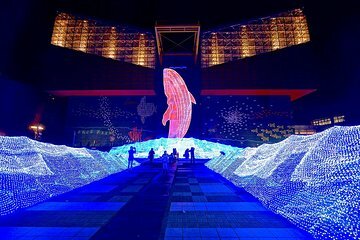 View a variety of marine life from across the globe with your admission ticket to the Osaka Aquarium Kaiyukan. Themed exhibits feature animals such as seals in the world's largest domed tank, rockhopper penguins in the Falkland Island zone, and a touch pool with sharks and stingrays. Check the daily schedule for animal feeding shows when you can watch the creatures interact with the keepers.